Samuel Rodgers is an artist and musician whose practice encompasses performance, composition, installation and phonography, and explores the spatial and material aspects of sound and listening. 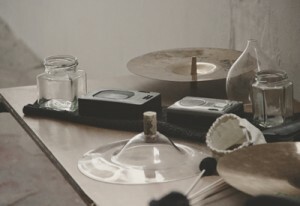 Samuel is currently artist in residence at the School of Art, University of Wolverhampton, and during the residency will be working with metal, producing a number of objects for acoustically filtering sound, as well as use as resonant percussion and preparations to the piano. Samuel will be exploring parallels between the making process and one’s interaction with materials within performance; an approach typified not by technique or mastery but by experimentation and exploration over time. This talk will also explore the influence of place and environment on the making process, and consider ways in which we might operate between or across the institutions and structures that we find ourselves within or subject to.